Does It Always Have To Be About Writing? My blog has been dormant for a month now. After the last Jot Conference I came to the realization that I was not growing much as a writer, at least not in the last year. I was writing, and that is always good, but I wanted to get better. I wanted to reach another plateau. I decided to get back into reading about writing and practicing what I read. 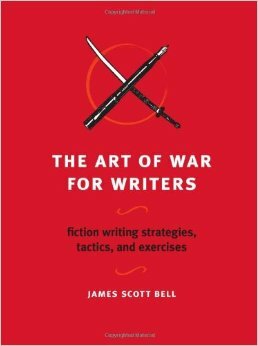 I’m reading The Art of War for Writers by James Scott Bell. On the cover it describes the content as: fiction writing strategies, tactics, and exercises. This book has been a revelation. It’s short, concise, like a daily devotional for the writer. I am reading it through now, and can imagine myself reading a brief chapter before my writing time in the evening. One of the most surprising things in the book was the emphasis on things other than writing. Of course, Mr. Bell mentions all writers must have a weekly word count goal built into their regimen and other routines the professional writer-to-be must incorporate, but tucked into its pages he also suggests doing things like memorizing a Chopin ballad, play the ukulele, go for a hike, and several other activities that have nothing to do with writing. Writing is my main hobby. I am working on another novel now and prepping a few short stories for submission, but I was getting burnt out. I gave every free moment I had to writing on my laptop. I work at a desk all day and stare at two computer monitors. I get my fill of screen time and thus it is hard to force myself to come to the computer when the day is done. However, when it came to free time and I wanted to go for a run, or watch hockey, or just read a book, guilt would creep in. Guilt that I wasn’t getting to my daily word count. Guilt that I was being a slacker and needed to get to work! Honestly, it would eat me up. This book has given me permission to enjoy my free time a bit more, and to do so without the guilt of not writing. I still write and still think of my novels and short stories all of the time, but it is also good to live, to refill your creative well, and to find joy in things other than writing. I also need to remember to use the revival these things can give and use it as fuel.